Luaipou Futi of American Samoa looked at a photo of her son Michael yesterday during a news conference in lawyer Rick Fried's office. With her were cousins Simamao Nofoa, left, and Simalua Sila. An ailing newborn from American Samoa would still be alive had he not been detained inappropriately at an airport checkpoint, the family's lawyer charged yesterday. Attorney Rick Fried plans to file a wrongful-death lawsuit against U.S. Customs and Border Protection on behalf of the baby, Michael Tony Futi, who died Friday, and his parents, Tony and Luaipou Futi of American Samoa. Michael's mother wept yesterday as she described her anguish. "If they would have let us come out immediately, my baby would still be here," she said. "I can't eat. I can't sleep. I'm traumatized with the whole situation." The baby was born Jan. 25 by Caesarean section at LBJ Tropical Medical Center in American Samoa, where his doctor discovered he had a hole in his heart. The child was due to undergo an examination at Kapiolani Medical Center for Women and Children for possible heart surgery. According to documents provided by Fried yesterday, federal customs officials faxed a waiver form to Hawaiian Airlines and LBJ Tropical Medical Center notifying them about the agency's approval for Michael's mother -- who was born in Western Samoa -- to travel to Honolulu. Fried said the mother and an accompanying nurse had U.S. passports. They arrived at Honolulu Airport about 5:30 a.m. on Friday and were the first off the plane. Apparently there was a problem with Luaipou Futi's waiver form and all were taken to the customs checkpoint, Fried said. Simamao Nofoa, who served as an interpreter in a news conference in Fried's office in Honolulu yesterday, said officials did not explain to Michael's mother why they were being held. The traveling nurse was unable to persuade officials to let her and the baby go while they sorted out the waiver issue with the mother. She arranged for her best friend, a nurse who works at Kapiolani Medical Center for Women & Children, to pick them up at Honolulu Airport. After a half-hour in the warm, locked room, the baby suffered respiratory failure, Fried said. Airport paramedics responded at 6:10 a.m. and administered cardiopulmonary resuscitation. An ambulance took Michael to Kaiser Medical Center at Moanalua, where he was pronounced dead. Autopsy results have been deferred pending further studies, according to the Medical Examiner's Office. Jim Kosciuk, spokesman for the U.S. Customs and Border Protection, declined to comment due to potential litigation. Fried will first file a required "notice of claim" form to the federal government. The government will have six months to accept or deny the claim. Michael was the couple's fourth child. 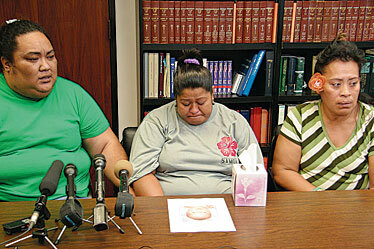 They have a 14-year-old son, a 13-year-old daughter and a 3-year-old adopted son. The traveling nurse who flew with 2-week-old baby Michael Tony Futi and his mother, Luaipou Futi, from American Samoa to Honolulu arranged for her best friend, a nurse who works at Kapiolani Medical Center for Women & Children, to pick them up at Honolulu Airport. No formal arrangements were made with the hospital to pick them up at the airport. Originally, this story said that a nurse from Kapiolani Medical Center went to the airport to pick up Michael Futi and his traveling nurse to drive them to the hospital.